Velvet Glove, Iron Fist: Have the health benefits of drinking been disproved? Have the health benefits of drinking been disproved? A study in the Lancet got a lot of media attention last week because it purported to disprove the health benefits of moderate drinking. No single study can do that, of course, but that's how it was reported. 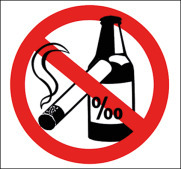 It was accompanied by an astonishing editorial calling for readers to 'Unite for a Framework Convention on Alcohol Control' next to the 'no smoking/drinking' image shown above. No slippery slope, eh? In short, the study looks at a Chinese population and argues that the J-Curve showing lower levels of stroke risk for moderate drinkers is an artifact of genetic differences. Two genotypes - ALDH2-rs671 and ADH1B-rs1229984 - are identified as suspects. The problem is that the former 'is mainly absent among Europeans but is prevalent in populations in East Asia' and the latter 'is found in 19 to 91% of East-Asians and 10 to 70% of West-Asians, but at rates ranging from zero to 10% in other populations'. Since most of the evidence for the J-Curve comes from western countries, it is not at all obvious that this explanation would hold up outside of Asia. I was in Belgrade for LibertyCon when the study was published and didn't have time to look at it in detail. In any case, I don't pretend to be an expert on Mendelian randomisation, which is what the findings rely on, and its authors aren't likely to win any awards from the Plain English Campaign. It is clear to anyone who has being paying attention to the shenanigans of the public health industry that the new Holy Grail for this pseudoscience is finding “proof positive” that the protective effects of moderate alcohol consumption are a myth. This is crucial to the more extreme elements that sadly dominate the discourse because, in their minds, it removes the last barrier to treating the alcohol industry as they have the tobacco industry and “denormalising” drinkers the way they have smokers. Most of the attempts to do this have been exposed as pseudoscientific window dressing for puritanical agendas but last week’s effort involved some real science for once. A study performed in China looked at people with genetic variants that reduce alcohol consumption. There are two genes involved so nine possible combinations of genotypes with a range of effects from making drinking alcohol very uncomfortable indeed to not having much effect at all. 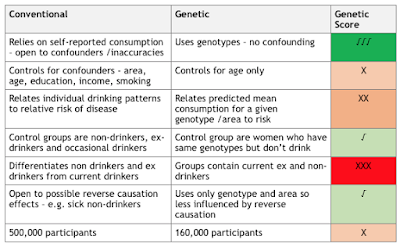 By looking at these groups it is possible to study incidence of stroke and heart disease relative to genotype and therefore ability to consume alcohol. Not a bad idea as it cuts out the reliance on what people say they drink and other confounders that make many epidemiological assertions equivalent to claiming to have split the atom with a bread knife. The normal process for revealing a novel technique or discovery in science is to rigorously test prior to publishing in the most prestigious journal possible, defend it in peer review, modify if needs be and eventually, perhaps inform the wider public. But public health isn’t science. It has agendas and rushes to publicise anything that supports them, often avoiding prestigious focussed journals by publishing in medical journals with low standards but high media profiles. Blood pressure and stroke risk increase steadily with increasing alcohol intake, and previous claims that 1-2 alcoholic drinks a day might protect against stroke are dismissed by new evidence from a genetic study involving 160,000 adults. So, a novel scientific approach that should be cautiously rolled out open to question and peer discussion is rushed into the public domain with sensational claims linked to a call to arms aimed at fans of industry / lifestyle hyper regulation. And the BBC didn’t think to question this? Or read the study? The rest of the press release talks about the study in brief detail but ignores an important section for reasons those of us familiar with the ethics of The Lancet and the lifestyle public health industry are all too familiar with. The new approach of genetic epidemiology was performed alongside a larger conventional epidemiology study which produced very different results. The conventional epidemiology produced the familiar J-shaped curve with non-drinkers and ex-drinkers having risk of stroke equivalent to people consuming around 25-30 units per week, which is consistent with many similar studies. The genetic epidemiology, by contrast, shows a steady increase in risk with consumption. Thanks to the laziness (or prejudice) of journalists and the selective briefing from The Lancet, most people, including those who make our laws will be blissfully unaware that the contradictory conventional results exist. I don’t think that is accidental. But why the difference in results? The authors of the paper are more circumspect than the press release but understandably talk up their genetic approach. They don’t offer any real explanation other than 'reverse causation and confounding', which is a feeble argument when you have segregated non-drinkers from ex-drinkers. If it were true, all of the lifestyle epidemiology that we have been bombarded with for decades becomes highly questionable. Mendelian randomisation does have benefits provided that the assumptions made are correct. However, the implementation in this case also has downsides and I have listed the pros and cons in the table below. 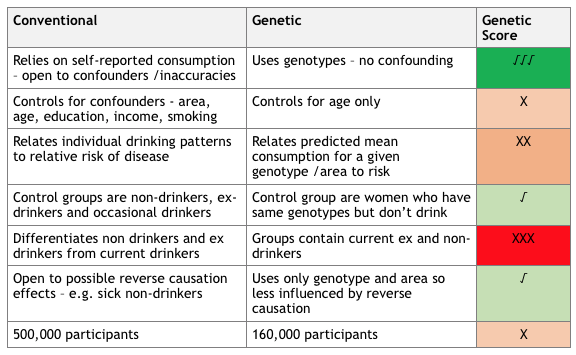 The great strength of the genetic approach is that it cuts out a lot of uncertainty around misreporting and other human confounding problems that bedevil conventional epidemiology, but the great weakness is that it doesn’t link individual drinking patterns to risk. The genetic study calculates mean consumption for each genotype in each area and assigns it to all participants in that group. This is a big departure from conventional epidemiology in which individuals are asked how much they drink. In this study, everyone has the same predicted consumption and therefore risk, irrespective of their actual consumption. 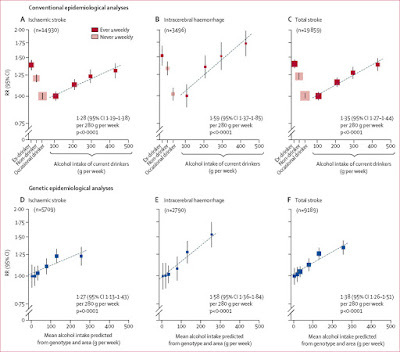 That is OK if you are wanting to show that genotype mediated capacity to drink is linked to increased risk of stroke or that stroke risk increases with consumption at the population level. It is less than fine if you are trying to claim that “one drink a day increases stroke risk” because you have no idea what is happening to individuals within groups, and sub populations can introduce bias. 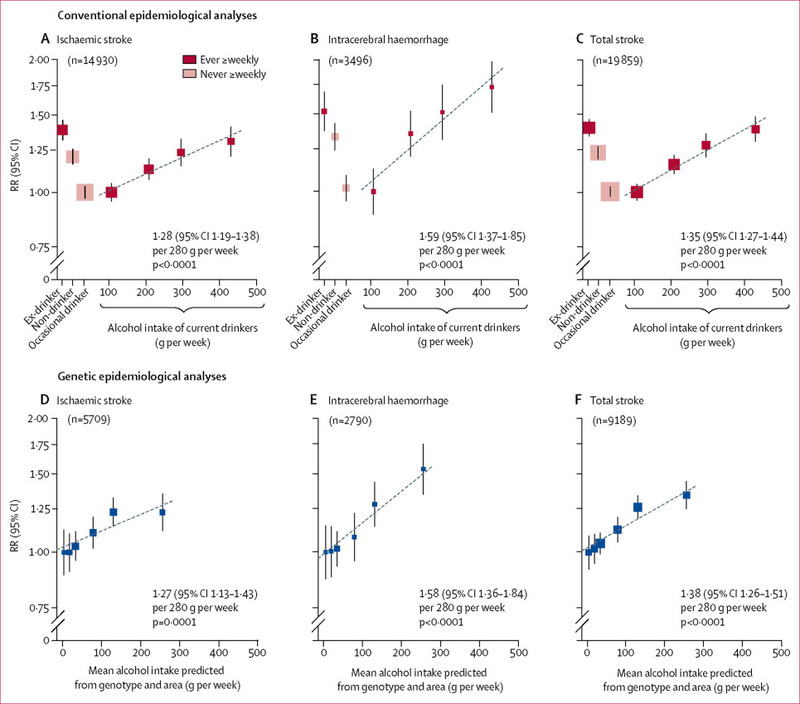 So, in the moderate drinker proxy group, the two most risky categories from conventional epidemiology are represented in almost equal numbers as moderate drinkers and considerably outnumber those drinking within UK government guidelines. The C4 group also included 12% non-drinkers and 48% occasional drinkers who were assigned a 0.5 unit (5g) weekly consumption. The net effect of that is to significantly reduce the mean for the group to the extent that it does not realistically represent consumption for current drinkers. One of the very concerning features of this study is that the authors seem over-eager to promote some contentious aspects but dismiss or ignore others. For example, the genetic study implied that around 10% of total strokes can be attributed to alcohol, double what is expected from the apparent impact on blood pressure. Rather than question the numbers, as any good scientist using a novel methodology would, the authors airily hypothesise why they are correct and then mass publicise them courtesy of The Lancet. If they are correct, we might expect to see some impact on regional stroke incidence but there is none. At the study extremes, the province of Gansu, where drinking incidence is lowest, has a higher incidence of stroke than Sichuan where consumption is over 12 times higher. Overall, I think that the use of Mendelian regression to reduce confounders is a positive for this study but the authors have been far too keen to make the data fit their preconceptions and have introduced their own confounders through their methodology. I do not believe that the study justifies the claims made by The Lancet and echoed in the media. I find it frustrating that the mainstream media cannot understand that melodramatically embargoed prejudiced press releases from scientifically and ethically questionable sources should be treated with suspicion. Until they do, their output will be distrusted by an increasing number of people who will look elsewhere for news. In some areas, particularly health, it is practically impossible to distinguish the output from the established media from the “fake” news online. An indication that this is a problem can be seen in the top-rated comments under the superficially balanced but embarrassingly uncritical and preachy BBC article on this study. So, not exactly a ringing customer endorsement of public health output, BBC editorial policy and its journalism. But they are not entirely to blame. It would help enormously if CRUK, BHF and the MRC stopped supporting ideological crusades and did something more useful with our money. After all, somewhere between 90% and 100% of strokes are nothing to do with alcohol. How many bookies will close?